They spell it rhumba. A night at Tropicana is noisy, mindless, boozy and a must, I'd say. Tuna fish. There’s a big photo of the tuna fish sandwich oozing mayo above the counter. No need to scan the vast encyclopedia of a menu. 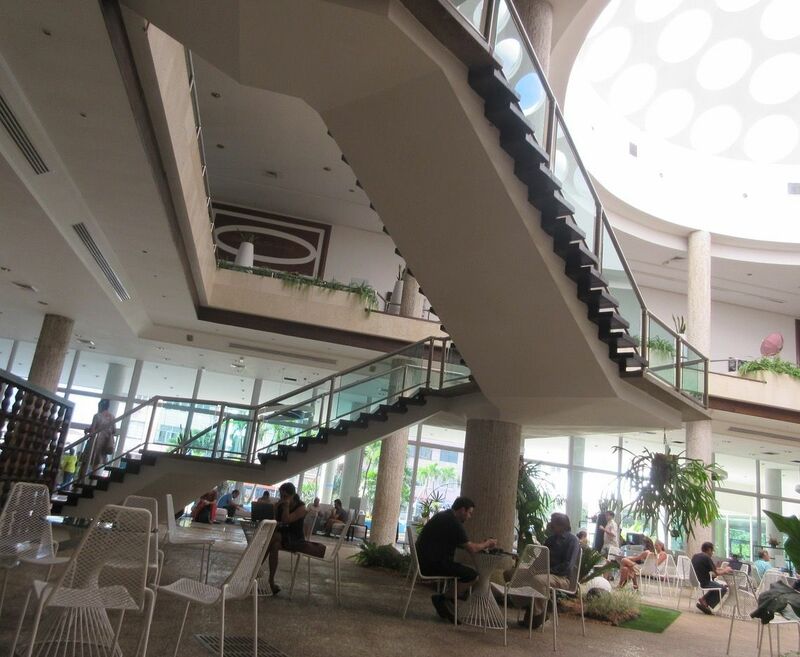 We’re sitting at a table in the Caféteria La Rampa, alongside the entrance ramp to the Habana Libra Hotel. 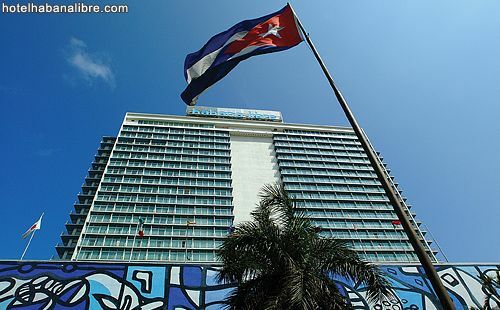 Originally, it was Meyer Lansky’s Hotel Habana Riviera. Then came the revolution and the government took over. 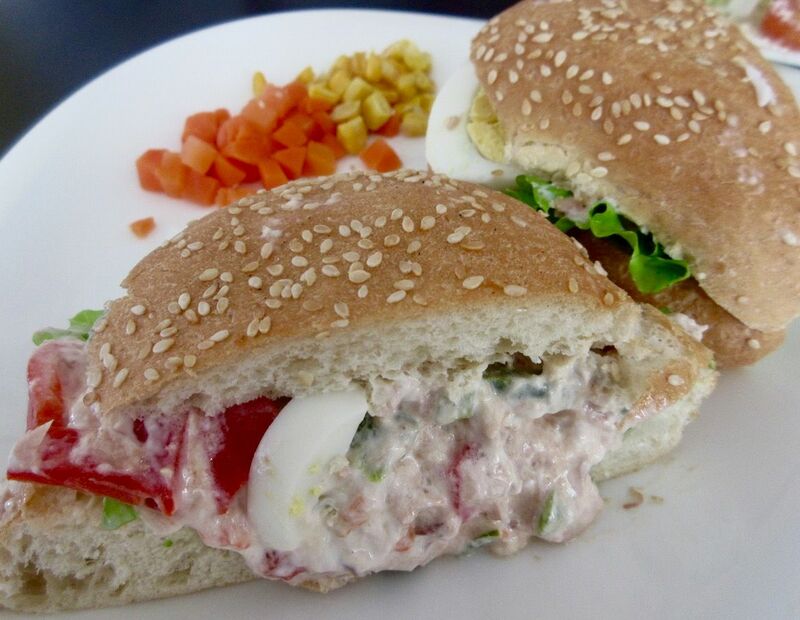 I'm thrilled to find a tuna salad sandwich with mayo at Hotel Havana Libre's Cafetéria del Rampa. My pals hope to use the lobby wi-fi to get online. A constant parade tripping down the lobby stairs, posing and primping, reminds me of the old Fontainebleau in Miami Beach. Scattered across the soaring space, the email-deprived stare at their phones. Days ago I gave up fighting for a connection. After all, we only have a week. Let’s devour images of Cuba. I’ve come along this morning for the ride and the promise of a visit to Coppelia, Havana’s celebrated ice cream mecca. It used to be Meyer Lansky's hotel jewel Habana Riviera. Now it belongs to the government. Bette Wanderman -- longtime devotee of Cuba, documentarian, self-styled Ginger Rogers, our tour leader -- looks at her watch. Lunch time. The menu (with English translations) is everything you didn’t realize you needed. I study it after all. Not just tuna. A club sandwich. 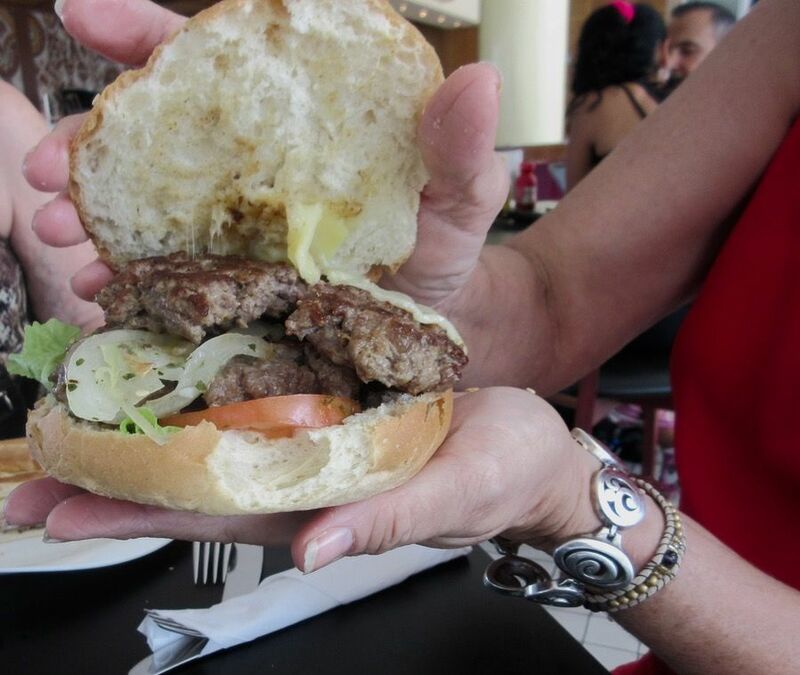 Hamburguesa doble. The sandwich dietético. A vampiro (banana omelet) on the kids menu. 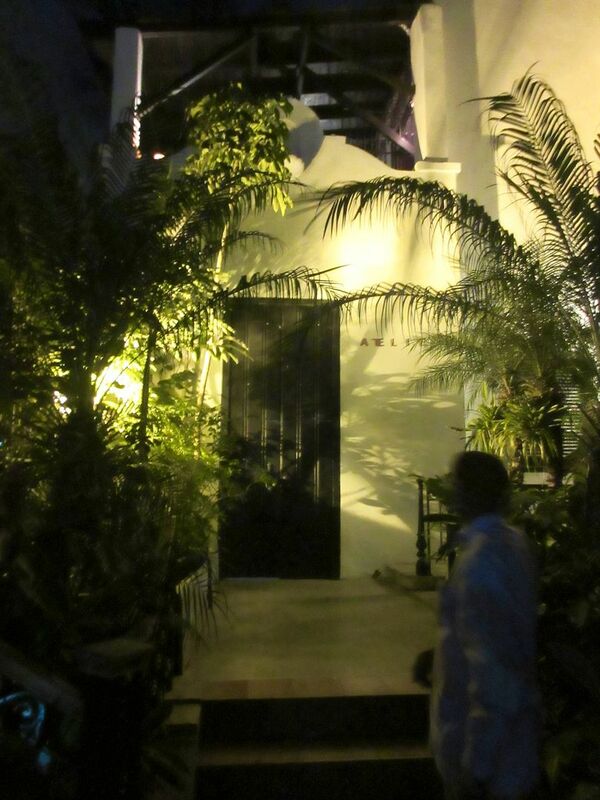 The action on the stairway at Hotel Havana Libre reminds me of the old Fountainbleau in Miami Beach. Hamburguesa with onion, cheese, tomato and lettuce is not bad at all. Ice cold frites get sent back for refrying. “I assume you have arranged a way to jump the line, “ I say, pointedly, challenging. By the sixth day our small group of entitled narcissists is in revolt from Bette’s somewhat whimsical plan. We’ve scattered in all directions. 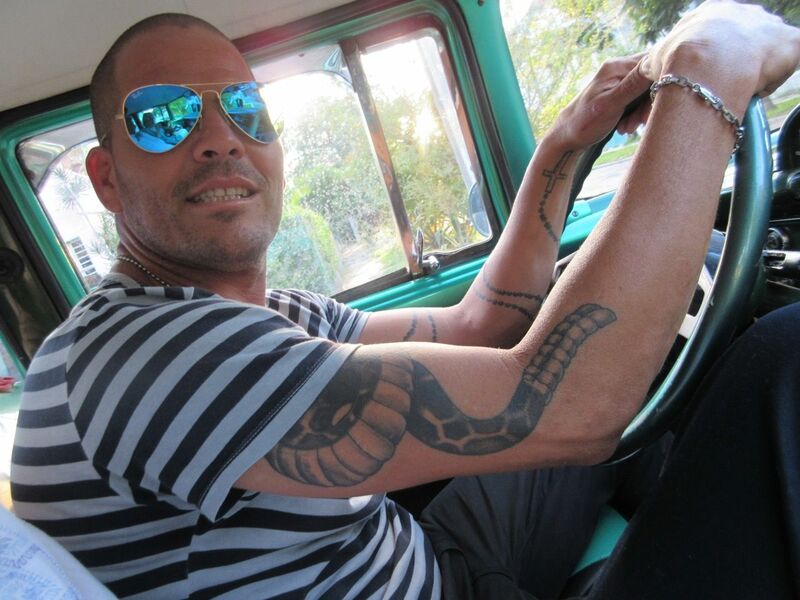 Half-Italian dreamboat Silvio, driver of a 1957 green Impala has a snake on one arm, a snake & crucifix on the other. 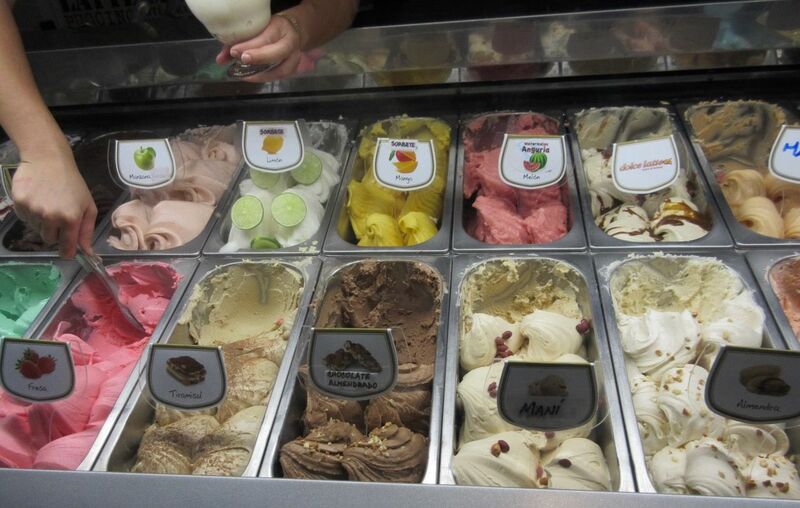 “Our driver Silvio says the new Casa del Gelato is the place to go,” Bette says now. When I signed up for this week with Bette in Cuba, I counted on her to know everything. I’m fast losing faith, seeing how close we came to that weary queue inching toward the famed ice cream mecca. The duo of young servers at Casa del Gelato speak English more or less. There's a sipigot for frozen yogurt too. What else does Silvio know? It’s a long detour to the House of Gelato across from the Copacabana. And it’s moved. But only around the corner. As soon as I see the list of 27 flavors, the cute little scoopers in Santa hats, the glass flask of ice cream cones, I know we’re in the right place. I ask for extra dark and nunez (nuts), medio e medio, half and half. (No nunez, alas.) I take cioccolato instead. We’ve had some pitiful ice cream in Havana restaurants, but we’ve had excellent ice cream too. This is not as lush as the Italian ice cream in Lima, or as rich as Laurent Tourondel’s at L’Amico, but it’s good. There's a choice of cups or cones, the usual flavors and then some, plus the makings of a sundae. We’re the only people at the Casa this sizzling December Wednesday afternoon, but that can’t last long. It’s listed in this week’s Havana Insider. As we pile back into the bright green 1958 Chevy, Lorenzo buys himself a cup to go, eating with both hands as he speeds us back home. La Casa Del Gelato. 46 Esq. 1ra, Miramar, Playa. 11 am to 9 pm. Seven days. 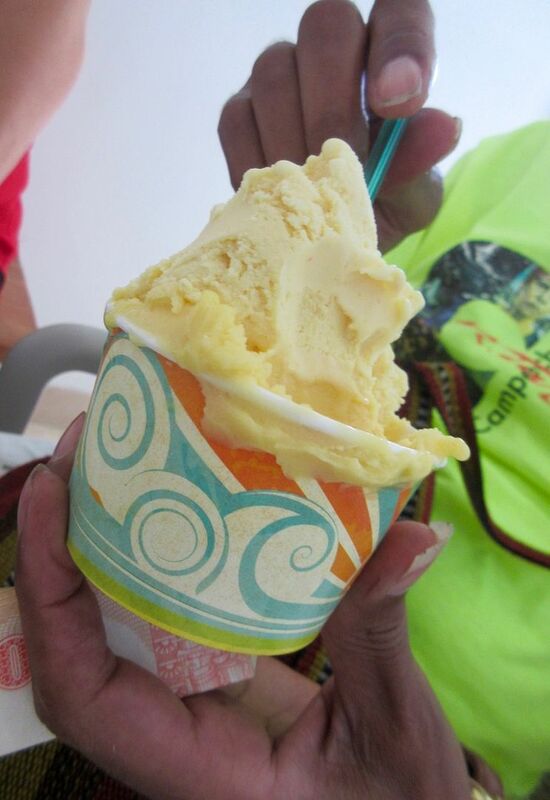 Pepe chooses mango and peach, and joins us at a table in the air conditioned shop alongside an ice cream cart. Pepe is Bette’s super-stylish Puerto Rican guy. He wears pressed Guayabera shirts with snap-on bow ties. Never in New York or here, where he supervises the hotel breakfast crew, have I seen him without a hat. He’s Latino, first of all, so Bette is torn between running the show and acquiescing to him like a Latina woman. When things go wrong, each blames the other. Paladar Atelier's warm welcome is up two flights of steps and a third to the open air balcony. Neither has ever been to Atelier before. That’s where we’re going for dinner before our night at the legendary Tropicana, where $100 pays for rum, cans of soft drinks, and a cigar for each of us, but does not include dinner, just snacks (broken peanuts to keep you ordering extra cocktails). 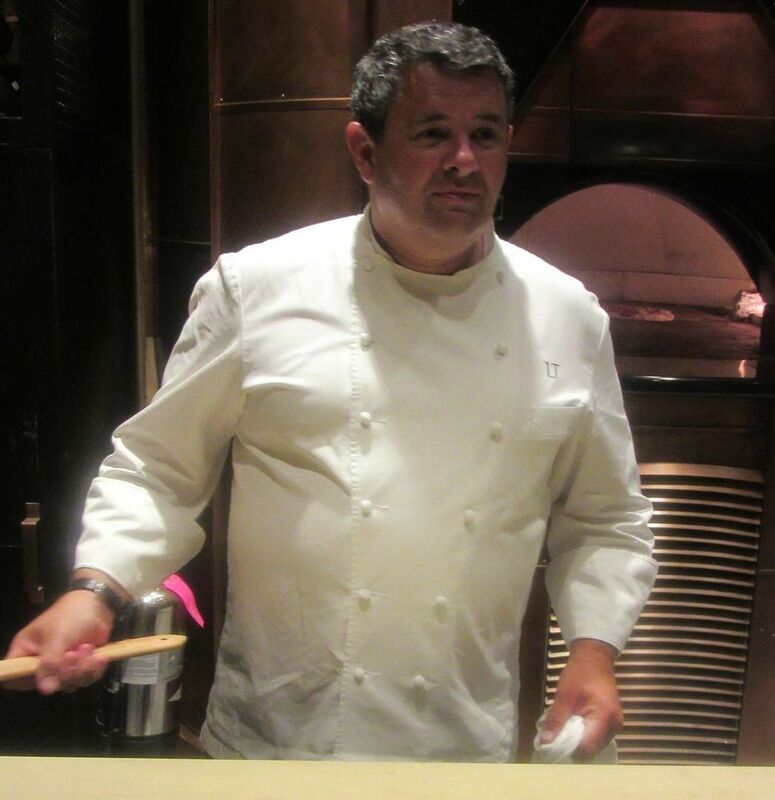 Atelier cooks from the daily market. There's no salmon today, but the tender octopus salad is a creative heap. 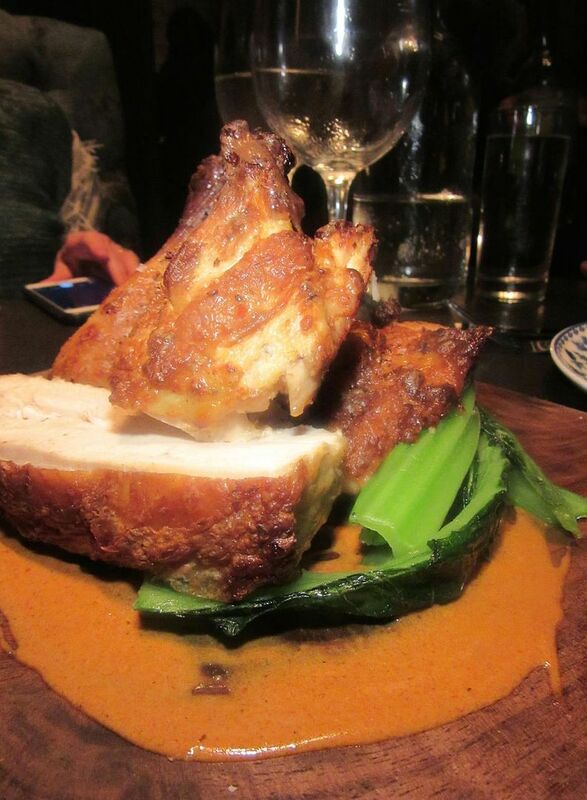 The terrace is the place to sit at Atelier. That’s where we are. Everyone agrees the food is very good. Pepe says he arranged it. 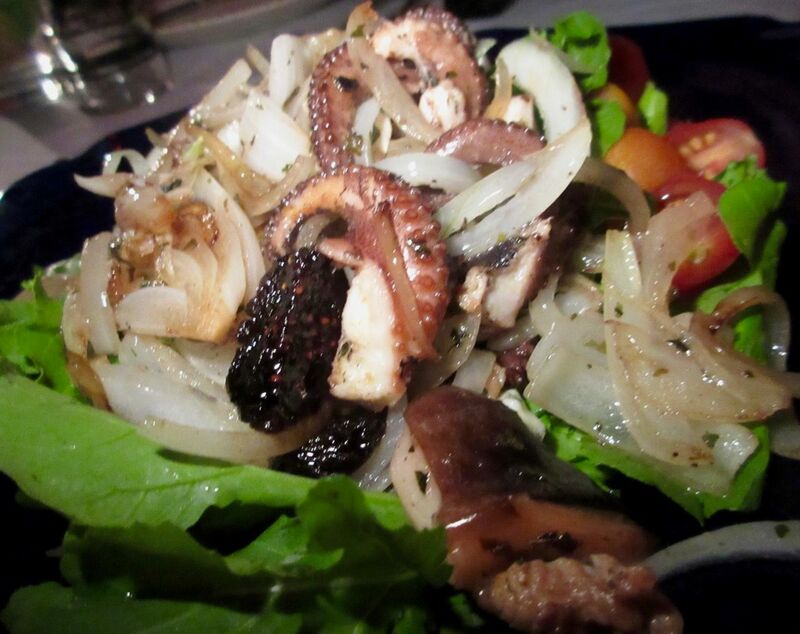 We all share the tender octopus piled high in an excellent salad. But where is my seafood starter? Across the roof we hear shouting in the kitchen. “They’re fighting,” says Pepe. It seems someone dropped my dish on the floor. 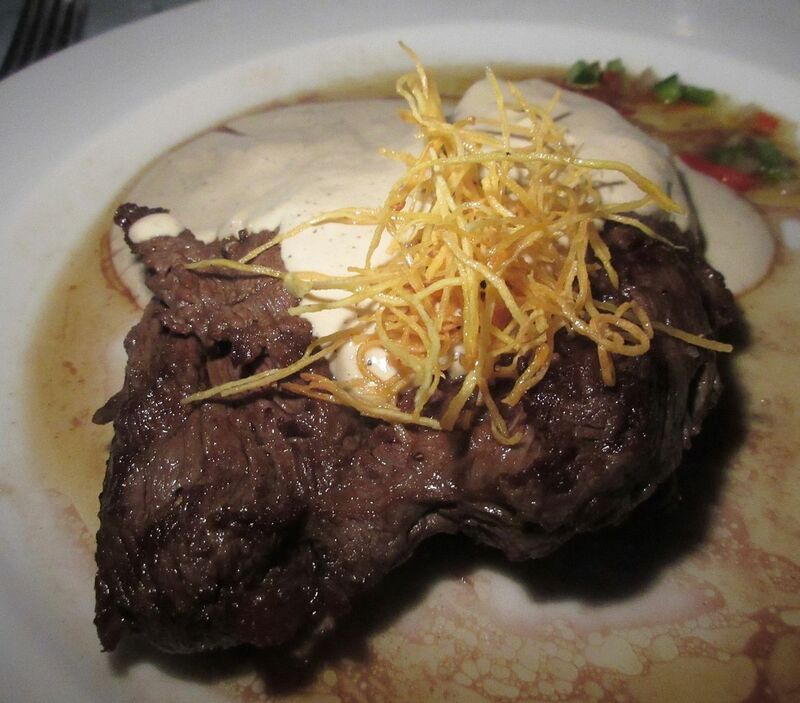 I've seen filet mignon on a few menus, but Atelier's thick chewy flank steak is a first. 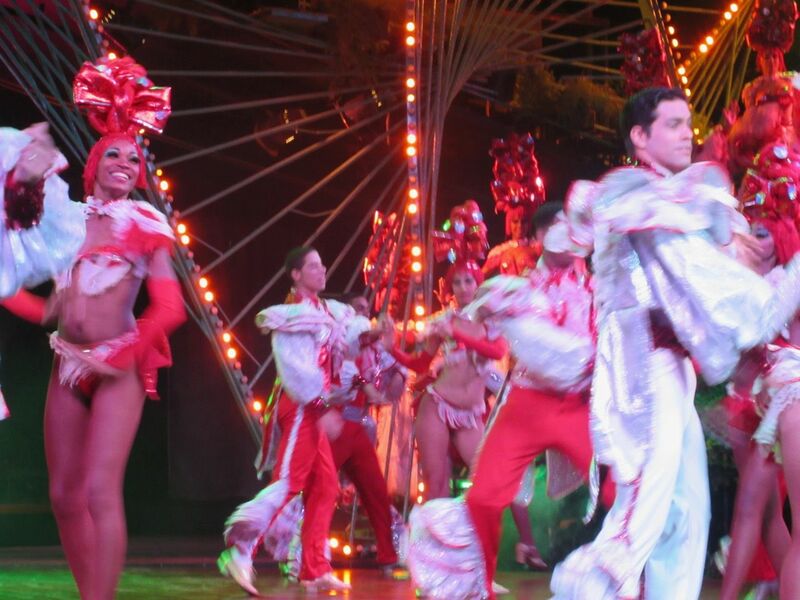 The Tropicana show opens with a big production number on three stages and costumes in outrageous colors. You think you’re too sophisticated for a night at the Tropicana? Maybe you are. But we weren’t. A couple of us fortified with sweet red watermelon cocktails. Others drank rum and Coke. Sure, I’d seen I Love Lucy and I knew Desi was a singer at Manhattan’s fictional Tropicana. But nothing quite prepared me for the al fresco stages nestled in the six-acre garden with an umbrella of ancient palms far overhead. For the slightly more than $100 entrance fee, you get a cigar and a pose from this welcoming beauty. Pepe has trekked to the Tropicana twice in advance to make sure we get a good table. Twice, he was turned away with no commitment. He asks us to wear our film festival badges so he can introduce us as judges at the entrance. The receptionist does look impressed. Sure, it can be hokey but there is magic in the legend and sitting outdoors in a six-acre park below ancient trees. The table just off the center looks sufficiently VIP to me. Finally the music begins. The singers set the scene. 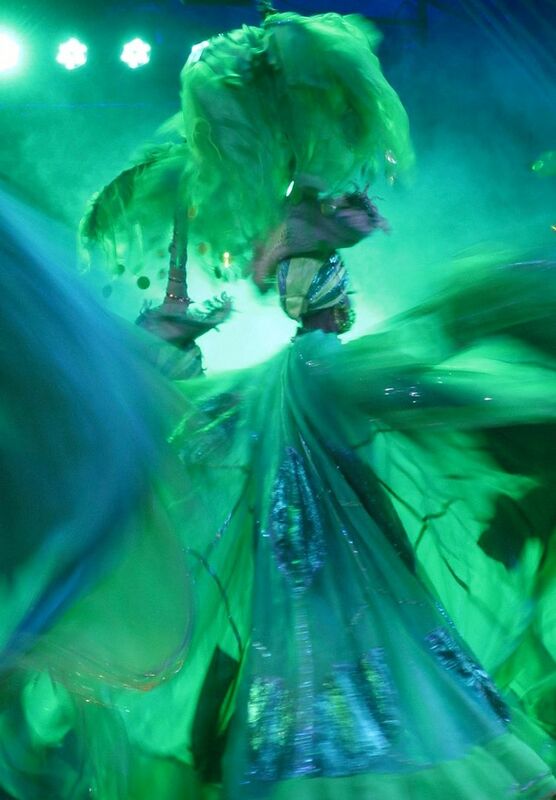 But it’s the dancers in their raucous colored ruffles that seize the stages. Most of the guys seem a little stiff and neuter. But the women shimmy and whirl – short ones with tight little derrieres, plump ones with jiggling rumps, skyscraper six-footers whose headdresses sweep the trees. On catwalks and elevated stages, and close in front of my right shoulder. The six-footers dance by our table brushing my arm with net and polyester, then swivel out to the back tables. 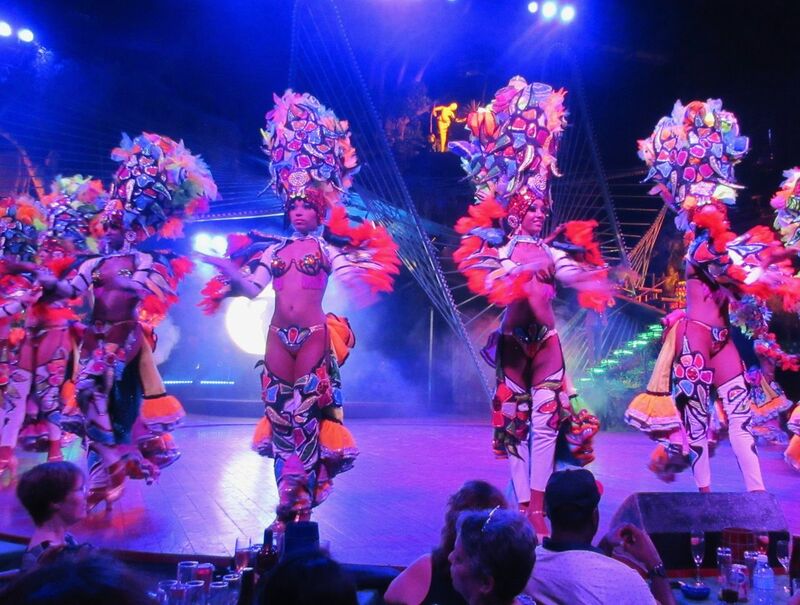 They parade by our table, smiling and swiveling, coarse fabric brushing my arm, then through the room and back. The flesh goddesses, as they were once known. Xavier Cugat, Paul Robeson, Yma Sumac. Carmen Miranda, and Nat King Cole played here. The house band had forty musicians. The gambling tables were right near the entrance, a template for Las Vegas. Now it’s noisy enough, amplified? Recorded? I can’t say. And non-stop. Only the gambling is gone. When the costumes become veils, there's less underneath. A template for Las Vegas. On and on, one routine melts into another, costumes growing scantier. Cuban, Spanish, African. A shocking slave interlude. Nervous giggle. Gasps. Acrobats punctuate the complicated production numbers. Moving chandeliers. Towering fruit baskets. Tourist cameras capturing it all (no extra charge). Near midnight, the dancers invite customers up on the stage. I see Pepe and Bette among them. Bette shows off her rhythmic sashay. 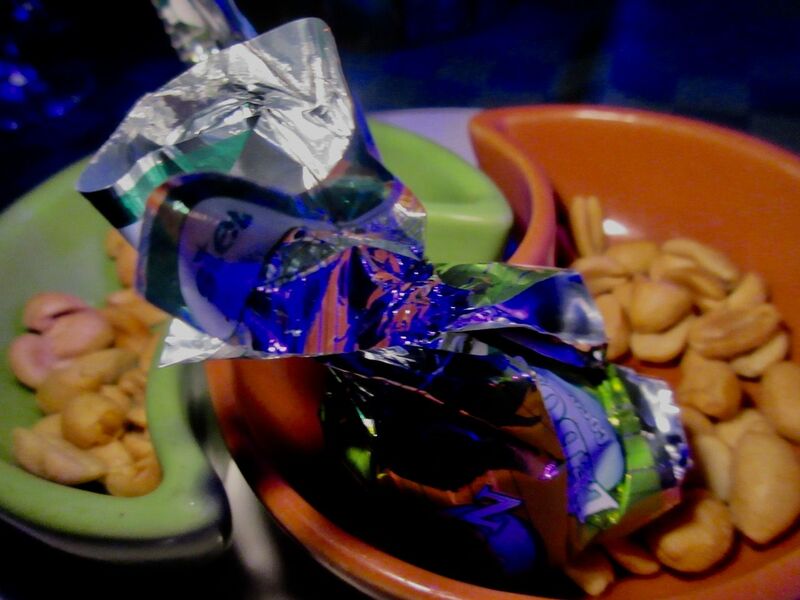 The promised "snacks" are these broken peanuts and a chocolate. This plastic dish is for two. I’ll pack for home in the morning. At breakfast I have the last of the oatmeal Pepe brought from home, yogurt with papaya, and apricot Danish from the nearby bakery. Cecilia has given me a new American translation of The Stranger by Camus. I pass along my vintage paperback, Nine Stories by J.D. Salinger to her. Perfect reading for Cuba, just starting to emerge from the ‘50’s. 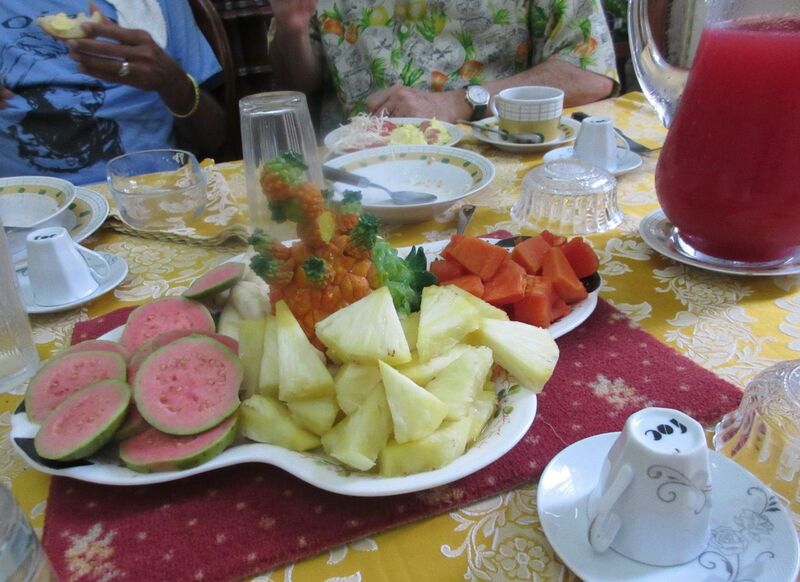 Breakfast at Casa Nostra, our private paladar, offers pinapple, guava and papaya juice, and fruit as well.